How many times have we heard that ‘three’s a charm?’ Most likely, more than you can count. Even in advertisement, for example: Easy, Breezy, and Beautiful – CoverGirl. Is it sheer luck? Or is it pure brilliance? As someone who plays with words on a regular basis, not so much in the blogging format, but from a titling perspective, three usually is the magic combination. And yes, even in Star Wars – the power of three is prominently present. 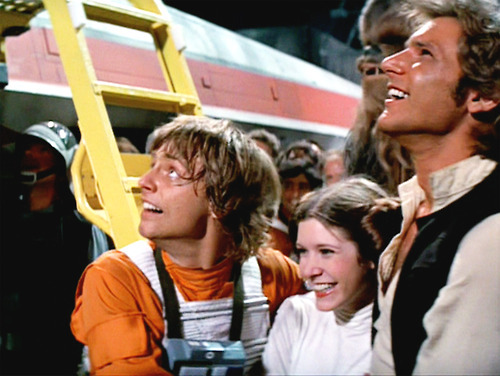 The ‘Big Three,’ better known to us as Luke, Leia, and Han, are the main gist of the original trilogy. Going out on a limb here, but even the story components are divided up into three, which in turn equates to our term trilogy, or trilogies. With that said, The Force Awakens will begin the third sequential troika of the Star Wars saga, aka sequel trilogy. The number three has been known since the beginning of time — well, documented time — to symbolize unity. Basically, no two lines can enclose the same space, in other words, they do not meet. But add a third line and it connects both points, becoming a unified body, without end. Take Catholicism for example: the Father, the Son, and the Holy Spirit; these three powerful beliefs coincide with God’s attributes of: omniscience, omnipresence, and omnipotence. George Lucas implemented a tripod of symbolism to Star Wars as well: the force, light side, and the dark side. Again, introducing another tie-in to the power of three and creating a phenomenon to last the ages – talk about one heck of a Divine Intervention. I don’t know about you, but when it comes to Star Wars and the ever-expanding — galaxy far, far away … I can imagine quite a bit. What about you? Next article Check Out the Latest Installment of 'Studying Skywalkers' by CWK Co-host Dan Z. Great as usual, Becca! I love the concept of threes, and especially the reference to the Father, Son, and Holy Ghost. Nice job! I think about the “big three” in Rebels, as well: Kanan, Ezra and Hera. Yes, Zeb and Sabine are in the mix, too, but it seems to me that the heart of Rebels truly revolves around the other three. Zeb is the “Chewie” of the group (having been based on Ralph McQuarrie’s original concept of Chewie himself), and Sabine (to me) is kind of like Lando — a “loner”, per se. As far as the Force, light side and dark side being three parts of a whole, I have a bit of an issue wrapping my head around agreeing with that… The Force is an entity unto itself, not part of an independent idea. It’s the theme, the “title.” I see the light side and dark side as more of a Venn Diagram, where there’s a part in the middle that overlaps…kind of like the idea of the “Dark Jedi” concept, if you buy into that from Legends lore. Just the way my brain works!! If I could draw you a picture here of what’s in my brain, I would, lol!! In essence, the power of three is an amazing thing. like a triangle, it is stable and balanced. I’ve noticed a lot of construction where bridges/overpasses are starting to use inverted triangles in place of the traditional bridge supports. The first college I went to had a trimester system rather than the more traditional semester system. The breaks in between each term were shorter (than their semester counterpart), but you know what? I liked trimesters better. (A) They allowed for more variety during the school year; (B) If there was a class that one didn’t particularly like, one didn’t have to suffer through it for the much longer semester; and (C) I preferred the faster pace of the courses (to get more info covered/work done in a shorter period of time). It helped keep boredom out of the lecture hall. 😉 Too bad more colleges and universities don’t employ this setup.